A few days ago Matt posted a chart of copyediting marks that we’re encountering while we review the copyedited version of REWORK. But as I’ve been going over the marked up version of the paper manuscript, I’ve really come to appreciate the handwritten red pen edits. I find them more informative and ultimately more readable than the made-by-machine track changes edits. I like that the original text isn’t obscured or changed inline. It’s marked up. The edits are, for the most part, overlaid on top of the original text. Any changes are distinctly different than the original text. This isn’t the case with traditional machine-made track changes edits. Those changes look the same as the original. They’re on the same layer. I find that distracting. For example, to suggest a capitalized “A”, you’d triple-underline the letter by hand. But on a computer you’d actually replace the lowercase “a” with an uppercase “A”, but the remnant “a” would remain. Over the course of many sentences and many changes, the machine-made track changes edits blend in too much with the original text. It becomes hard to quickly spot changes. And it becomes hard to actually read the original to the changes. I find the top example (by hand) clearer and easier to read than the second example (by machine). Lesson learned: Don’t be so quick to dismiss the old in favor of the new just because the new seems like it should be better. There’s a lot of subtlety that can be communicated in a pen stroke that can’t be fit into a rigid digital rule. Jason Fried wrote this on Aug 27 2009 There are 41 comments. Does anybody know of software that essentially replicates the “analogue” way of tracking changes? Comparing the computer vs. handwritten edits begs the question: Why don’t/didn’t computers adopt traditional copyediting style? The day will come when machine beats man at this task too. Happened with chess almost a decade ago…. May not be worth the time and effort, but that’d be an awesome modification to writeboard – which has made me hate word more than I already did by the way. :) Maybe certain edits could show up in old school format as you outline in the example? A by-product (editing), of a by-product (rework) on a page that’s talking about by-products. Whoa. 1) Most people catch more mistakes on paper than on the screen. Since it’s very expensive to publish paper books, perfection is a high priority. 2) When reviewing a marked-up manuscript, the author/reviser must process each change. (You can’t click “Accept all changes.”) No editor is perfect, so the author will catch their mistakes. The author also learns the style of the editor/house, so future manuscripts will have fewer edits. Finally, some edits are suggestions that the author can/will ignore in their revision. 3) Each publisher has its own in-house style. I’m sure computers could be programmed/training to follow in-house style guides, but why bother, when humans can do it so well? Pen edits are great if the person writing in pen can write so others can read it. Like if I were to edit your book, it would look like a 3 year old had done it. Not sure I agree with linking directly to pages though either. If they remove about/index.htm, its a bit hard to change links in a book once it has been printed. Agreed, tracked changes are a bear to work w/ and copyediting marks are much clearer. That said, what you lose in readability you gain in the speed of an electronic workflow. 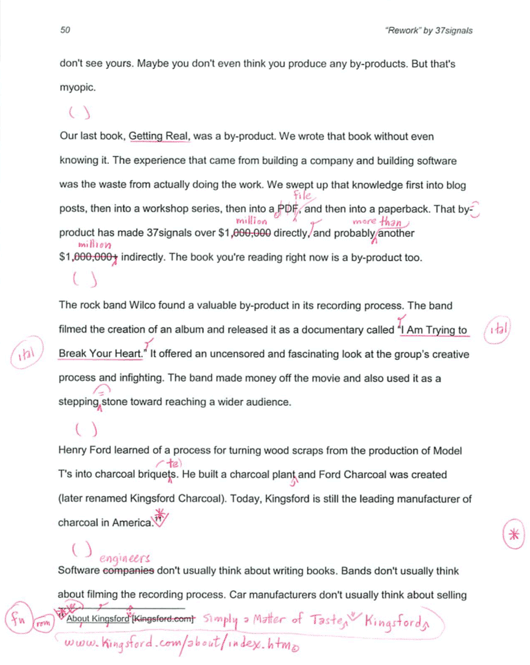 @Alex Muller: Acrobat allows you to make all sorts of editorial marks, and you can even use the pen tool to just replicate traditional copyediting marks, though that gets pretty tedious. In my experience most of the Acrobat editing tools are cumbersome or produce marks can be easily missed by people reviewing the document, so you’re best off sticking w/ whatever shows up clearest and abandoning trying to do traditional markup. Actually to me the color is the most important. In your example if the computer edit was in red I think it would be ok. Although I take your point, I don’t know that the two really compare all that closely. Copy editor’s marks are a very clear way to see the recommended edits. On the other hand, track changes in your word processing software really only reveals the actual changes that someone makes. Really two different goals from where I sit. @Andrew – I, too, would love to see 37signals tackle this problem with changes to Writeboard. Jason is right in his post that the old method of markup works better than the new, but an existing “good enough” solution shouldn’t stop further innovation. Thank you for mentioning this! I agree completely about the superiority of old-school, on-paper editing. Also, Michael, I especially agree with your points 1 and 2. When copyediting remotely, track changes is certainly nice for the expense and time saved shipping, scanning or faxing hand-edited manuscripts back and forth. And if edits are minimal, track changes works well enough. But when intensive editing or even just lots of little edits are in order, I don’t think track changes comes close to the effectiveness, thoroughness and clarity of hand-written editing. Is it just me or are others of you finding that so many published pieces (whether books or online articles) seem to contain ever-increasing amounts of mistakes that should have been caught. Track changes or not, where are the copy editors these days? Reading the transcript, for realz? You guys have sold enough copies of Getting Real that you’ve made over $1 million bucks just the sale of that book? Wow. I guess you’ve sold A LOT more than the 1,750 copies (about $25,000) since your last post on the topic. @Adam: I personally cite the full URL, even if it might one day become a 404, because I always include the date on which I visited the address. The exact URL and date information can actually be valuable with services such as the Wayback Machine. Tim: Yes. We’ve sold tens of thousands of copies of Getting Real now. hellllooo, correction marks are so how we work today in the print world. It is far from being old school. We have been so lured by companies like Adobe or Microsoft who try to reinvent (and sell) the wheel that we have forgotten what works and what doesn’t. I’m glad that you guys are doing a book in print because it will probably show why Writeboard has some space for improvement. Why not just use a white board? Isn’t that the whole purpose of having a centralized location. In a previous job I would have the nightmare of tracking down multiple instances of paper markup and then deciphering peoples chicken scratch or conflicting opinions of grammatical correctness. It was a freaking nightmare. Paper seems like a step in the wrong direction. If you have already made over $1 million bucks selling directly to customers the PDF version, at $19 per download (which is essentially 100% profit) ... why then go to a publisher to sell the book when you’ll then only make about $1-2 per book sold? Tim: Because this next book isn’t just about profit, it’s about exposure. We want to reach entirely new audiences we can’t reach on our own. We believe publishing a mainstream book that’s in mainstream bookstores will help us achieve that goal. We’re great at reaching the audience we can reach ourselves with a PDF and a self-published paperback via Lulu, but we want the NYT Bestseller list. So if you had to do it all again, would you self publish Getting Real or do the professional publishing route? What about the Defensive Design book? Denis: I’d self publish Getting Real again. It was the perfect book to self publish. And I’m happy with our decision to publish REWORK through a traditional publisher. Defensive Design… Probably self publish if I could do it again. We advise our freelance editors to advise their authors to read the edited version with “Highlight changes on screen” turned off, turning it on only to check editing changes at specific points in the text. Thus authors are generally reading clean copy, which is much easier to read than either text with handwritten changes or files with “Highlight changes” turned on, especially for medium to heavy editing. I use red text when critiquing a text file to help it stand out. It takes much longer to make the notes on what’s wrong, though it also forces me to explain the changes I want made – making it more than a pure copyediting session. For pure typos, the handwritten model is simply superior. Hopefully eventually we’ll get a hybrid program out of Adobe that will let you view manuscripts, mark with a pen function and add little text boxes, but in our Microsoft Word-defined world, that’s unlikely to catch on soon. Henry Ford learned of a process to create charcoal briquettes from the wood scraps left over from the production of Model T cars. I like the text compare variant that most wikisystems use. Both new and old text right next to each other. But I guess every task when it comes to text editing needs a different tool. Great post. It’s true that handwritten edits allow the editor to be more thorough and accurate, but I find that when I mark up someone’s document in red pen that it it takes more time for them to make all of the changes and, if they are in a hurry, can lead to things being missed. On the computer, they have the ability to review each change individually, which means each suggestion gets considered. Additionally, it saves trees if we are not printing countless rough drafts. Nothing more old-school than pen and paper – and nothing is a more refreshing change. In my day-to-day mobile workplaces, I’ve found writing on paper and later transcribing my thoughts into the computer is far more productive than solely composing on the computer. Doing things digitally isn’t necessarily the best way for everything. It isn’t truly man vs. machine because computers and pens/paper are all tools used by man. Pen and paper tends to be more natural to use because we don’t have to think about the tools (unless we rip the paper or run out of ink) and can focus more easily on the task. Electronic copy editing provides the benefit of instant collaboration and correction over long distances, but you have to hassle with learning the tools. As electronic tools become more natural and simple to use, more people will justify using them (cost vs. benefit). This is a great post. I think we often do find better ways to do things when we look at them differently, whether aided by technology or not. But sometimes the traditional way of doing things sticks for a reason. It will be interesting to see if a digital solution can ever beat out the “old” technology in this instance. The cap A could be in the editor’s color (which you can change to red, if you don’t like blue), and there would be a bubble in the right margin that shows the editor deleted the lower-case a.
I find track changes infinitely more workable when lots of changes are required. For a final proof hard copy is always best, but it would result in an unreadable manuscript at the copy-editing stage in many cases. It’s also handy when multiple people view and change the same manuscript—each person’s changes are in a different color and, if you’re using bubbles, marked by name. In France where I live and work [and marked up copy for about 20 years] they use a different set of proofing marks. At first, adapting from English marks was hard but I’ve come to appreciate the French ones [they are pretty similar, there can’t be 99 ways to say ‘exchange these two letters’...]. One thing that I do particularly like about the French way is that mostly you just have a strike mark in your copy [extended with an underline when it concerns more than one letter or sign or space [yes, i know a space is a sign, but not everybody does]], and the action that needs to be taken then appears next to a strike sign in the margins. This leaves the typescript clean [and keeps arguments to the margins]. @Alex Muller, Revizr does a pretty good job of matching traditional editing marks. After more than a hundred books (as a packager and then as an author) and in conforming the copyeditor marks over 25 years, I’ve evolved. At the beginning, I was defensive and angry. I didn’t like the ‘tone’ of the copyeditor, and it was painful to make all these changes, many of them inane. Over the last four years, though, I’ve decided to trust the system. And if you’re going to trust the system, the marks are annoying and wasteful. I have a copyeditor I adore. She turns on track changes and edits my book in Word. She sends it back. In less than an hour, I’ve accepted 98% of her changes and we’re done. If Word had existed a hundred years ago and authors had accepted the wisdom of copyeditors, these marks never would have come to be. imho. Seth: You may be right, but I don’t have the experience with 100 books like you do. And I don’t have a relationship with a copyeditor like you do. So for me, I like the hand written marks. But I could see it becoming tedious and excessive after a while – especially if you and your copyeditor begin to share a brain. I agree those copy-editing marks look better than the track changes display, but I don’t think this should be seen as a matter of ‘done by hand’ vs ‘done by computer’. It’s a matter of one style of representing edits being more effective than another. There’s nothing that inherently ties a representation style to a particular media (pen and paper, or computer). When you replace one word with another in Word, it could show the change like the hand-written one does, for example. I think Track Changes is symptomatic of a more general shortcoming of all existing software: they’re hopeless when it comes to annotations. Most software simply has no support for adding annotations to bits of your information (in your address book, your image files, your calendar, email, etc etc.). There might be a separate ‘note’ field, but that’s nothing like being able to add real annotations, like you can do on paper. As the post points out, annotations should stand out as separate from what they are annotating, but I don’t know of any existing software that gets this aspect of annotations right. I should also say that I think there’s often subtleties in hand-written annotations – like in the positioning of the annotation in relation to what it applies to, the size of the annotation text etc – and you might not be able to capture these as well on a computer just with keyboard and mouse (though you could try to find a way)... you might need a pen based input. This is exactly why I was bugging the IT department at my company for almost two years to get me a Tablet PC. I finally have one (HP2730p), and I couldn’t be happier. Now I spend all that time doing document review with a digital pen in my hand, then email off the results when I’m done. Love it! There are some things that are way easier to correct by writing on the page vs. tracked changes and “comments”. There’s another real power in old school pen and paper – it’s immediate and visceral. There’s still something special about the simple mark on a piece of paper. However, I do wonder if software could get better at distinguishing these corrections apart from the text – there must be ways of making the correction format nicer than the strike through model, which I also find irritating and confusing.